Wow, did January ever fly by!! I cannot believe we will already be celebrating Groundhog Day this week! This is one of my favorite bulletin boards! Each and every little groundhog turns out so adorable and slightly different from the next. The kiddos truly enjoy making this little guy. Throughout the week, I read the kiddos a few Groundhog Day books to help explain the whole purpose behind Groundhog Day. Here are a few of my favorites (click to follow the affiliate link to grab these on Amazon). During our ELA lessons, we work on sensory adjectives. We’ve discussed adjectives quite a bit in class, yet it remains an area where we can use continued support and practice. Sensory adjectives are always fun. We revisit these types of chart throughout the week as kiddos come up with more ideas. I like the idea of keep charts up and adding to them over time. It keeps them immersed in the topic and helps ensure mastery. Ultimately we work on our interactive reader by completing the text with sensory adjectives and illustrating each page with our own ideas. We save the book to finish off our craft we create on Groundhog Day. Another way we will incorporate Groundhog Day into our week and ELA block is with this little rhyming interactive reader. Rhyming readers are a great way to practice decoding. The readers take the onset/rhyme principal a little deeper and encourages practical application through text decoding. It is one of my favorite ways to build phonic rule mastery. The Rhyme Time with Groundhog Phil reader in this resource is a great way to practice reading and decoding skills while using those long vowel rules and applying them to rhyme. The kiddos love illustrating this book too! Each kiddo kind of does their own spin on it. I love thisboard. Some of these little guys are just absolutely HILARIOUS! 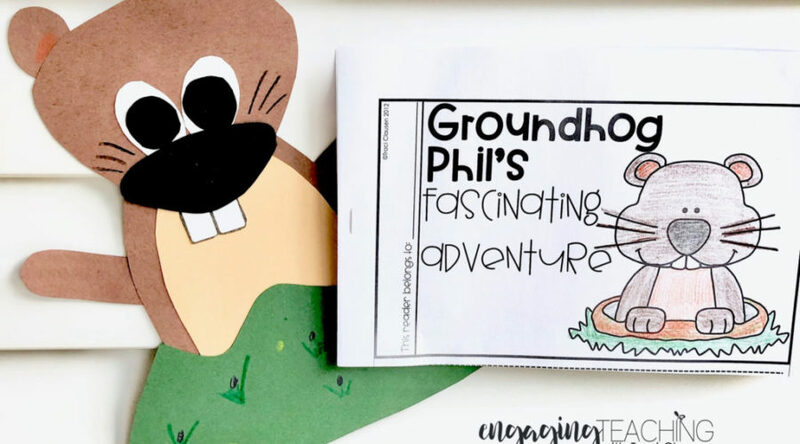 You can grab Groundhog Phil’s Fascinating Adventure in my store.